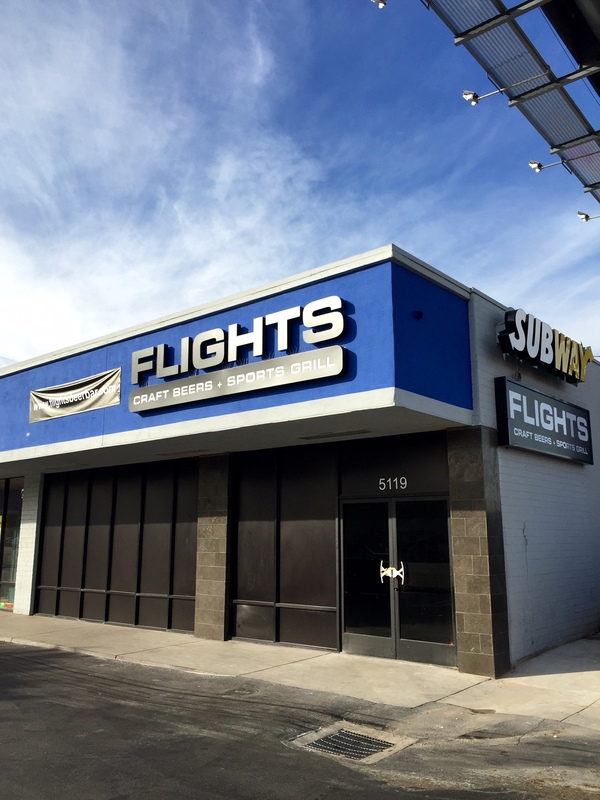 Remember back in January when I told you about the impending arrival of Flights Craft Beers + Sports Grill, the new bar with 40 beers on tap, an interesting menu, and odd location (5119 W. El Segundo Blvd, in Hawthorne)? I’ve been carefully watching this story because the Manhattan Beach/El Segundo food scene is exploding right now and Flights is the farthest east of all of the new upcoming restaurants. Well, after delaying their opening a few weeks, they eventually opened for business on March 25th. Shortly thereafter however, they had to close their doors due to health and safety code violations. A letter pasted under the notice of closure on the front door explains that the moving of an ice machine and installation of a new washing machine required new permits that they simply didn’t know about. But they are planning on reopening as soon as they can. 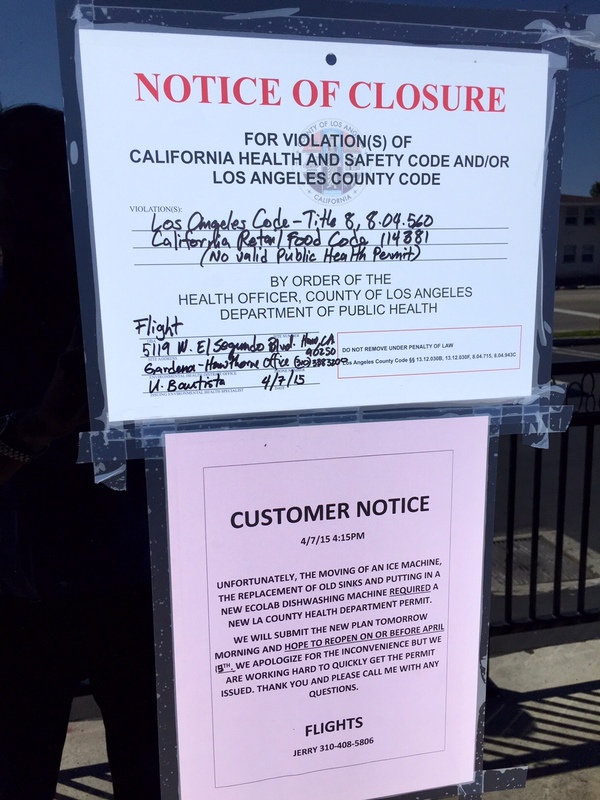 Please fasten your seatbelt and put your seat in the upright position… Recently, I told you about a new sports bar being built in an unlikely place on the edge of El Segundo. 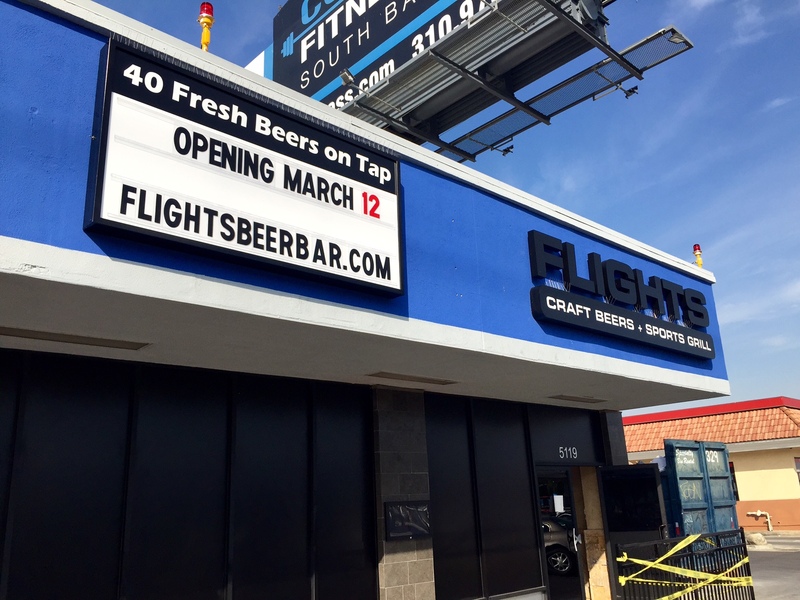 According to their sign, it appears that Flights Craft Beers + Sports Grill will be coming in for a landing on March 12th at 5119 W. El Segundo Blvd (just to the east of the 405). Until then, check out their menu and their selection of 40 beers on tap here. Update: The opening has been pushed back to March 25th. Could this be an indication that the El Segundo/Manhattan Beach food scene is pushing east? Looking somewhat out-of-place, I just notices that a new, sleek sports grill is going into a spot in a strip mall in a particularly bleak section of Hawthorne just to the east of the 405 at 5119 W. El Segundo Blvd. What appears to be a fairly extensive build-out will soon house Flights Craft Beers + Sports Grill, which promises 40 different fresh beers on tap and a menu composed of such things as poutine, hefeweizen cheddar cheese fondue, and a variety of sliders. Looks like they’re shooting for a February opening. In the mean time, check out their website here.